Composer and sound artist David Dunn presents works highlighting complexity in natural and human-made systems. These compositions reveal and amplify hidden auditory features of the natural world, sounds outside of normal human perception, interactions between artificial intelligence systems and living creatures, and models of chaotic change endemic to the kinds of forces currently shaping our environment. Along with three short pre-recorded works involving environmental sounds, Dunn will also perform Thresholds & Fragile States, a live work using self-built non-linear chaotic oscillators capable of generating an infinite variety of “auditory behaviors” emergent from their status as autonomous electronic systems. Based upon the theory of “biological autonomy” and new principles in cognitive science, these circuits represent an alternative design philosophy for the creation of electronic sound synthesis. More akin to living systems than information processing devices, they produce a dazzling assortment of complex noises and any sounds produced by the circuits emerge as a type of “conversation” that exhibits repetitive action at a local level but tremendous global diversity over extended time periods. The control of circuit parameters determines a range of instabilities and structural couplings between nested chaotic circuits, allowing these autonomous behaviors to emerge. David Dunn is a composer who primarily engages in site-specific interactions or research-oriented activities. Much of his current work is focused on the development of listening strategies and technologies for environmental sound monitoring in both aesthetic and scientific contexts. He is internationally known for his articulation of frameworks that combine the arts and sciences towards practical environmental activism and problem solving. As a pioneer in the fields of acoustic ecology, bioacoustics, interspecies communication, and scientific sonification, he has composed a body of innovative and experimental musical work and has contributed to projects as diverse as sensory enhancement of healthcare environments, intervention strategies for forest and agricultural pests, reducing sensory deprivation problems in captive animals, and the design of international broadcast networks. 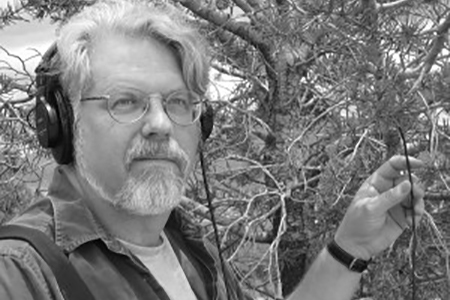 As an expert wildlife recordist, Dunn has invented microphones to record such phenomena as the sounds of bark beetles within trees and underwater invertebrates in freshwater ponds, and the design of self-organizing autonomous sound systems for interaction between artificial and natural non-human systems. Underlying all his work is a common regard for music as a communicative source with a living world.